School buses are one of the most common forms of transportation used by children on a daily basis. Like all other public transportation operators, the drivers of these buses have a responsibility to safely deliver their passengers to and from school. 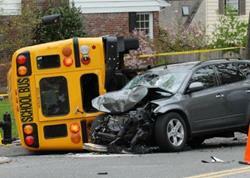 Despite this important responsibility, however, dozens of innocents die each year as a result of school-bus accidents. If your child has sustained an injury from a school-bus accident, you may be entitled to compensation from those responsible. Child school-bus injury lawyer Jeffrey Killino helps children and families nationwide achieve the justice they deserve. Call 877-875-2927 to learn more. Though the National Highway Traffic Safety Administration (NHTSA) has opined that riding to school in a school bus is safer for children than making the same trip in their parents’ cars, the adequacy of school-bus safety standards has often been questioned by other organizations. The American Academy of Pediatrics (AAP), for instance, has urged authorities to require seat-belts on school buses though they are not currently required under federal law. Legal liability for injuries sustained by your child in a school-bus accident may depend on the type of parties involved. If the school bus is owned by a public school, for instance, the school’s liability for an accident may be limited by governmental immunity, even if the accident was caused by the negligence of its employee, the bus driver. When governmental immunity applies, many states will hold ordinarily immune defendants liable only if the defendant is found to have been guilty of gross rather than simple negligence. To defeat the defendant’s immunity, the plaintiff must establish that the defendant was reckless or willfully disregarded the safety of others. The drivers of privately-owned buses are not protected by governmental immunity and may be found liable for injuries caused by the driver’s simple, rather than gross, negligence. Because such drivers are considered “common carriers,” they are held to a higher standard of care than other drivers, making their simple negligence easier to prove. If a school-bus maintenance company’s negligent maintenance is found to have been a cause of a school-bus accident resulting in your child’s injuries, the maintenance company may also be held liable in a negligence action for the damages associated with those injuries. If a manufacturing or design defect in the school bus that was involved in an accident is found to have been a cause of the accident, a product-liability action may be brought against the manufacturer and anyone else in the chain of distribution. The defect can involve any part of the school bus, such as tires, brakes, fuel systems, or accelerators. If a defect in a particular part or component was a cause of the accident that led to a child’s injuries, the company that manufactured, distributed, or sold that component may be found liable in strict liability. If your child has suffered an injury in a school-bus accident, you may be entitled to compensation for the injuries sustained. Contact school-bus accident lawyer Jeffrey Killino at 877-875-2927 for expert and experienced assistance in pursuing your legal rights.